Palm Desert greets the season with an after-sundown glow. 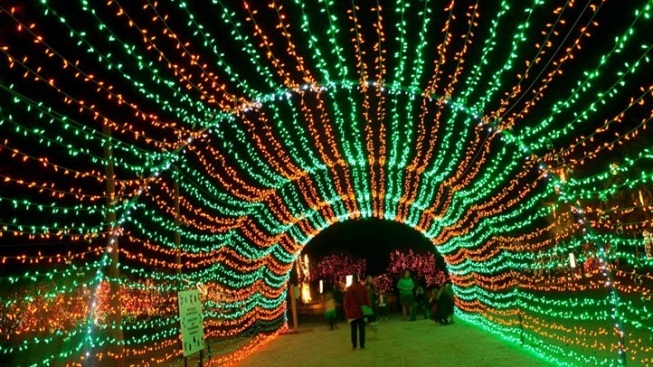 WildLights opens at The Living Desert in Palm Desert on Tuesday, Nov. 25. SPARKLY SUCCULENTS, CHRISTMASY CACTI: Celebrating the yuletide in an arid clime isn't exactly like winding strings of cranberries and popcorn around a tall fir tree. The desert is a starker scene, typically with less flora though the plantlife, and wildlife for that matter, is no less impressive than any fir-lined mountain ridge or meadow. Thinking about how to festoon a rockier, more thorny, sun-bright stretch takes creativity, something that The Living Desert people have shown for several years via WildLights. The annual nighttime walk-around is very much about the holidays, about sparkle, about thousands of bulbs clustered together, and about that oh-so-Palm-Desert-y setting. Nope, the designers of the evening spectacle aren't trying to reproduce a Christmas glow show found elsewhere; they're devoted to their desert environs. AS FOR DAYTIME OUTINGS? Those are still on during the holidays, though the sun shall provide the illumination, and not thousands of cheerful strings. Look for bobcats, badgers, and tortoises, among other critters, around the pretty grounds.